Yep…she makes you carry her halfway around the world. In tenth grade, my school required me to buy a graphing calculator. My trusty TI-85 and I became inseparable when I realized it came with its own programming language. I spent days in my bedroom, hunched over my calculator with thumbs blitzing like epileptic clog dancers until I managed to program a simple, shoddy dungeon crawler with about 20 rooms and 4 or 5 monsters that could beat you into negative hit points. It filled the calculator’s entire memory, had more bugs than a gas station bathroom, and I only played it once, but I still loved it. The next year I upgraded to a TI-89 and shinier, newer games found their way to me, including Phoenix, a 4-level version of Mario, a version of Tetris where blocks fell all the way down when their supporting blocks vanished, and a four-screen-map sequel to Final Fantasy VII with two characters, one boss fight, not enough monsters to level-up, and an inconclusive ending. Any of these math-class knock-offs released on a dedicated gaming console would have undoubtedly given the impression that the video game industry had replaced all their experienced developers with a team of lemurs who had a penchant for writing fanfiction. They glitched. They wasted memory. They ran poorly on systems not designed for games. I had a Playstation and an N-64 by this point. I didn’t need these crummy games; yet I still played them. 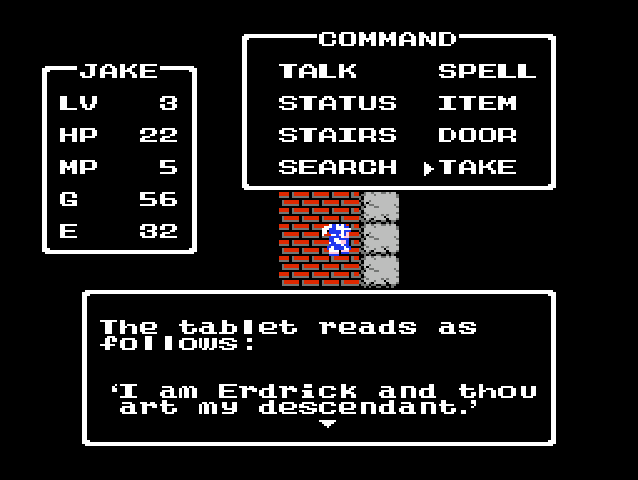 I mention this because my recent play-through of the 1986 RPG legend, Dragon Warrior, left me in a quandary, puzzled over how games with as much substance as a half-finished knock-knock joke written on a pizza box can gather a large enough fan following to inspire one of the most long-lived series in video game history. 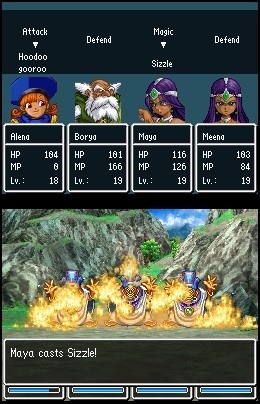 Dragon Warrior (known in Japan as “Dragon Quest”) hails from an age where RPG developers wanted to re-create the Dungeons and Dragons experience without the dice, paper, or need for that pesky socialization, but hadn’t yet figured out that interactive storytelling doesn’t exactly work the same way with pre-programmed computer characters. As such, you play as _______, and up-and-coming warrior with the charm, charisma and personality of Edward Cullen after eating his weight in magic brownies. The King of Tantagel, in a display of straightforwardness that most video game mystics would find offensive, gives you a simple task: 1) Find the princess and 2) Kill the Dragonlord. After which, young ________ ambles through the world, slaughtering the indigenous fauna until he feels confident enough to carry out the assassination the king entrusted to him. As much as the simplicity sounds like a breath of fresh air, however, we play games exactly for the roundabout nature of questing. In fact, if you’ve spent any length of time with literature professors, they’ll remind you that the world’s alleged greatest, most classic piece of literature focused entirely on Odysseus gallivanting around the Mediterranean for years, cavorting with nymphs while “guilt” over his marital fidelity “tortured” him, when it may have only taken him two or three weeks simply to walk home. 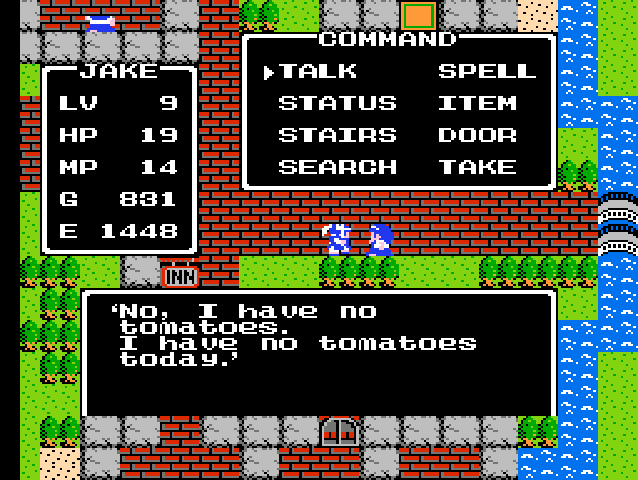 I get that NES cartridges didn’t have the capacity to store complex stories, but like most RPGs from the 1980s, Dragon Warrior has a problem with math. Leveling up to the point where the Dragonlord won’t vaporize you like a bottle of Zippo fluid requires over 20,000 experience. The most reasonable enemy to fight while level grinding gives you 54. With nothing to do in-game, I hope you have a second TV in your living room because you may want to put on a movie while you grind. I humbly accept this quest my liege, and…did you just take my wallet? Furthermore, your gold supply creeps up with an impressive lack of urgency, while weapons and armor can run as high as 14800. To add to the tedium, every time ________ dies, he wakes up in front of the King of Tantagel, who admonishes you for having the gall to allow the overpowered monsters of the countryside maul you to death. The first time this happened, I didn’t realize that I kept all the experience earned since I last saved because my gold stock had dropped substantially from the moment of my death. But Eventually I realized that in addition to chewing you out for your audacious apathy toward life, the King takes half your gold every time he revives you. Is it to late to reconsider your offer? After my initial outburst of anger at having to replenish larger and larger sums of money at each death, this got me thinking. One of the inconsistencies in the design, only certain buildings have roofs and entrances, while the rest simply appear as walled-off areas with a gap to pass through. The fact that some areas have inside maps suggests that the houses without them actually remain open to the elements. 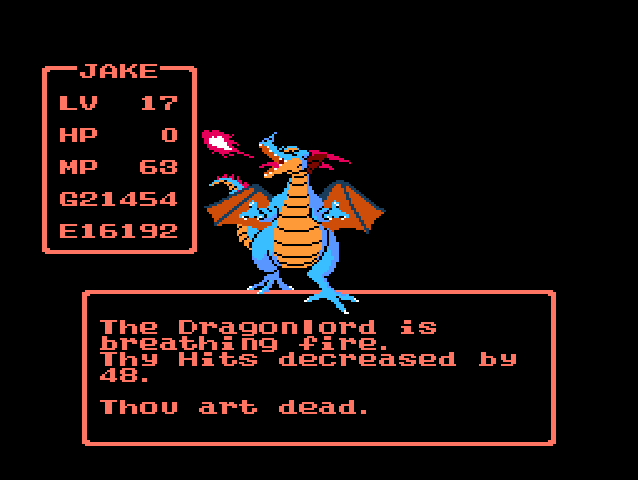 With a king who rifles through dead men’s pockets for loose change, I began to wonder if the Dragonlord might actually want to enact social change in the land of Alfgard. Perhaps instead of the black-and-white good-versus-evil trope of the fantasy genre, the villain’s crime doesn’t extend beyond threatening the provincial villagers with scary, scary change. Unfortunately, while the game does offer the chance to team up with him, taking that option will end in a game-over after days and days of piling up monster corpses for the scraps of stat bonuses necessary to get that far. First the old man asks me to find his balls, and now this guy? Another factor that compounds the tedium stems from the cryptic hints and clues as to how to finish your quest, gleaned from random townsfolk throughout the game. The King shoves you out the door with absolutely zero direction, and every step you have to take you have to guess based on riddles thrown at you. They’ll point you in vague directions, or suggest items that you must infer you need to progress, or even tell you to visit certain people in certain towns, most of the time leaving you to guess the names of each town because the game won’t label them in any way. Rather than send myself into an angry rant, let me describe it this way; Any game that forces me to look up a walkthrough to progress automatically earns one strike against it. If upon figuring out what I need to know, I still feel like I couldn’t have figured it out on my own no matter how much time I gave it, the game earns another strike. 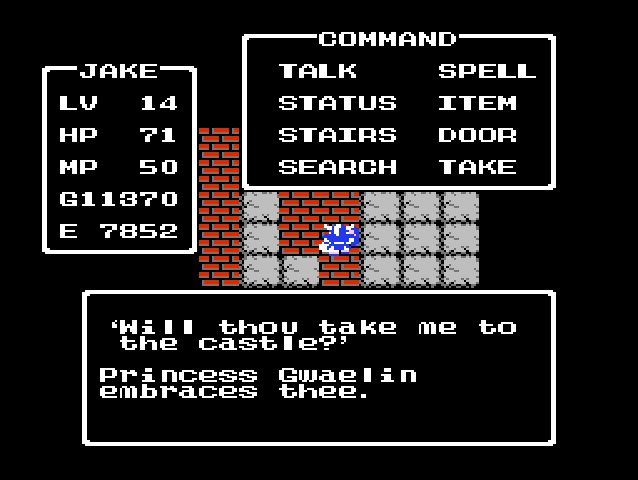 Dragon Warrior forced me to create a third category; games where I look up the walkthrough and still can’t figure out the puzzles. 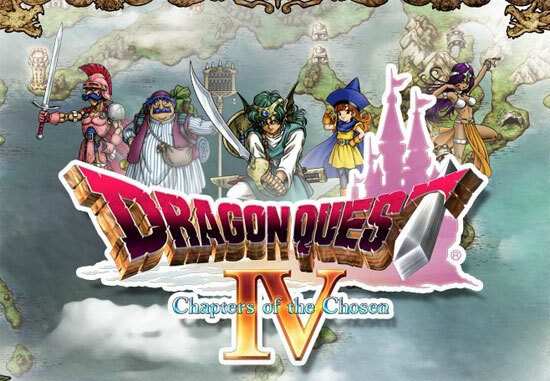 Dragon Warrior boasts its artwork, done by Akira Toriyama (Dragonball, Chrono Trigger), which could have saved this game…if I had seen any of his influence in it. Maybe the designers based the sprites off the interesting, colorful designs that probably looked something like Goku, but the 16×16 pixel designs couldn’t even hint that Toriyama had any hand in the game development. Someone else clearly did the box art, and I even downloaded the original instruction manual, hoping for more than the second-rate fan art that often graced the pages of NES games intended for 8-year-olds. But no. Even Toriyama couldn’t save this game. 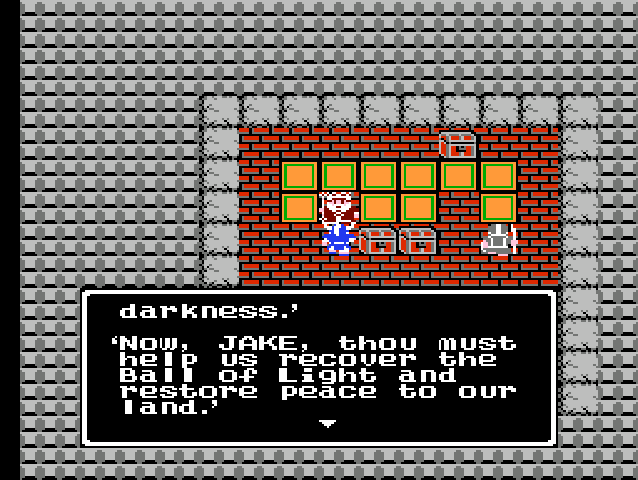 But still, as the first NES-era RPG released in Japan, the series succeeded. People there love it. 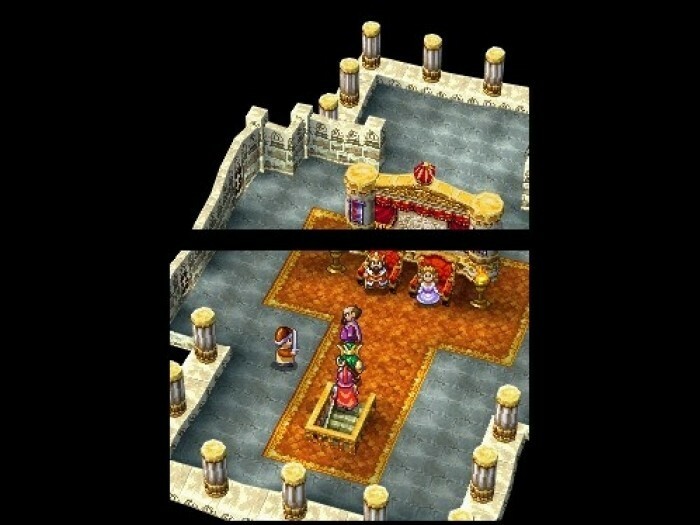 They perform Dragon Quest music at major symphonic performances. Video games hold an advantage over movies in that their sequels don’t have to recycle the rotting corpses of the original, so I do trust that the later games in the series surpass the first by far. I can only explain its success via my calculator story; the portability and disguise of an education tool allowed me to take games into places previously forbidden, places I couldn’t exactly lug my Playstation. Having it with me gave me an option. 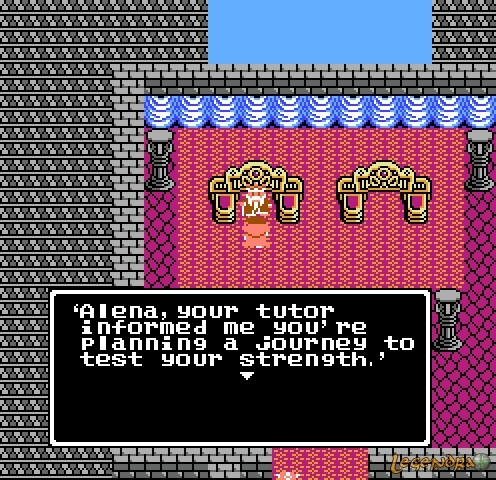 I enjoyed it more for the novelty of its existence rather than the value of its games, and Dragon Warrior can certainly claim the same novelty for its era and console. 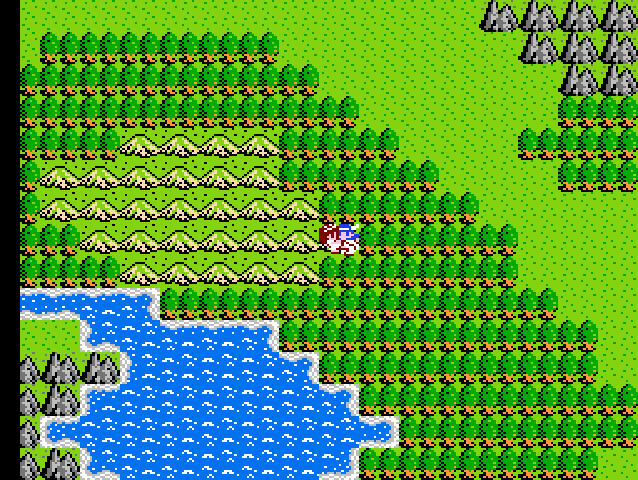 Still, the painfully slow pace of the grinding, also seen in Final Fantasy (released the following year in both Japan and North America, while Dragon Quest waited three years to cross the pacific…I wonder if that has anything to do with the popularity of each series in each region. ), along with the dangerously unstable battery-backed saves of the NES cartridges, tell me I should put my time into the SNES-era games instead.